Welcome to the Jackson Hole Super 8 Motel, located just minutes from Historic Town Square, in beautiful Jackson Hole, Wyoming. Come enjoy our warm western hospitality! The Super 8 Motel offers comfortable and convenient lodging while visiting Yellowstone, Grand Teton or any of the region’s unparalleled parks and recreation areas. 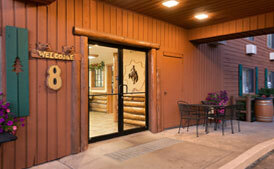 Close to skiing, river rafting, shops and restaurants, this lodge-style motel is the perfect stop along your way. All guestrooms include free high speed WI-FI, cable TV with HBO and ESPN, and free local calls. Our lobby computer offers you the convenience of Internet access without using your own device. Complimentary breakfast is offered every morning and delicious snacks every evening. I enjoyed my stay at Super 8 in Jackson Hole. It was easy to find. The room was very clean and comfortable and the staff was very friendly, courteous and helpful. Will definitely return to Jackson and will plan on staying there in the future. Not only were the facilities great, but the staff was outgoing, friendly and efficient–especially Kevin at the front desk. The breakfast area was always neat, clean and well stocked with a good variety of food. The beds were comfortable and the room clean and well furnished. Our stay was pleasant in every way. We would definitely stay here in the future.